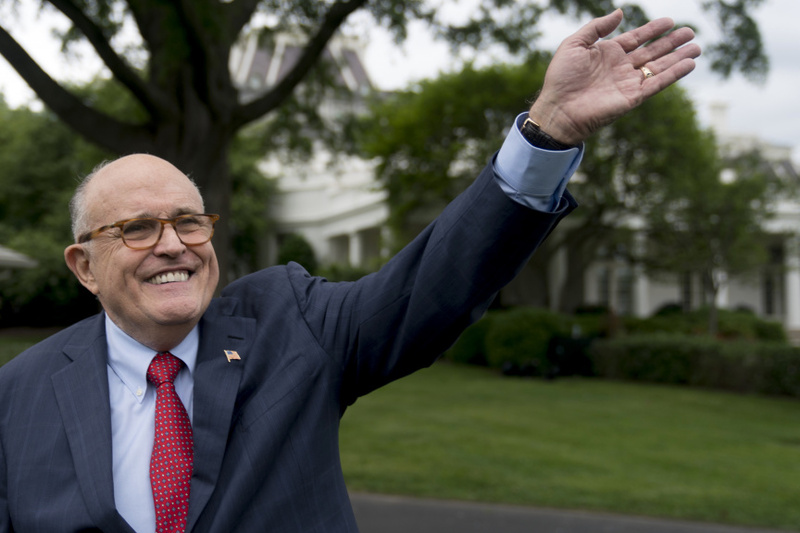 JERUSALEM (AP) — Former New York Mayor Rudy Giuliani on Wednesday boasted that Donald Trump's tough line had forced the North Korean leader to beg to re-schedule a high-profile summit after the president abruptly called off the meeting. After the cancellation, "Kim Jong Un got back on his hands and knees and begged for it, which is exactly the position you want to put him in," Giuliani told a business conference in the Israeli city of Tel Aviv. In an interview later with The Associated Press, Giuliani rejected suggestions that such comments might sour the atmosphere ahead of next week's summit, saying that the North Korean leader must understand that the United States is in a position of strength. "It is pointing out that the president is the stronger figure," Giuliani told the AP. "And you're not going to have useful negotiations unless he accepts that." Giuliani said Trump had no choice but to call off the meeting after the North Koreans insulted Vice President Mike Pence, National Security Adviser John Bolton and threatened "nuclear annihilation" of the U.S.
"President Trump didn't take that. What he did was he called off the summit," he said. "That's what I mean by begging for it," Giuliani said. Giuliani, Trump's lawyer in the Russian investigation, noted that he was sharing a personal opinion and was not part of the U.S. foreign policy team. Speaking earlier at the Globes capital market conference, Giuliani suggested high-pressure tactics should be used with the Palestinian Authority, which has cut off ties with the U.S. to protest Trump's decision to recognize contested Jerusalem as Israel's capital. "They have to be seeking peace. You've got to change the dynamic and put the pressure on them," Giuliani said. Giuliani is leading the defense of Trump in special counsel Robert Mueller's investigation into whether Trump associates coordinated with Russia during the 2016 presidential election, and whether Trump took steps to shut down that investigation through actions, including the firing of FBI Director James Comey. Trump's team and allies have waged a public relations campaign against Mueller and the Justice Department to discredit the investigation and soften the impact of the special counsel's potential findings. In the latest salvo, Giuliani accused Mueller of trying to "frame" the president. Giuliani claimed that Mueller has produced no evidence of wrongdoing by the president, and has stacked his team with partisan Democrats, including supporters of Hillary Clinton's presidential campaign. "They don't have a crime. And that's why I say they're trying to frame him. Because if they had any sense, they would realize they're trying to put together a case on an innocent man. And that's what we call in America framing somebody," Giuliani said. "We're trying to purify institutions," he added, accusing the media of trying to convict Trump and saying the prosecutors are "not saints" immune from attack. Nonetheless, Giuliani said he remains in touch with Mueller, and that there have been discussions about allowing investigators to question the president. But he said his client needs assurances he won't be railroaded. "The president would very much like to do an interview. His lawyers are very, very suspicious," he said. "They're going to have to convince us that it's going to be a fair interview." "If they can show us some hard, incriminating facts from that evidence, then we would consider advising our client to be interviewed," he said.